Among the guests were Donald Taylor, president of Cabrini College; Neil Theobald, president of Temple University; Jerry Parker, president of Delaware County Community College; Father Peter Donohue, president of Villanova University; and Donald Generals, president of Community College of Philadelphia (CCP). Each one of them provided a perspective on current challenges higher education is facing, particularly when it comes to Latino students and their representation. 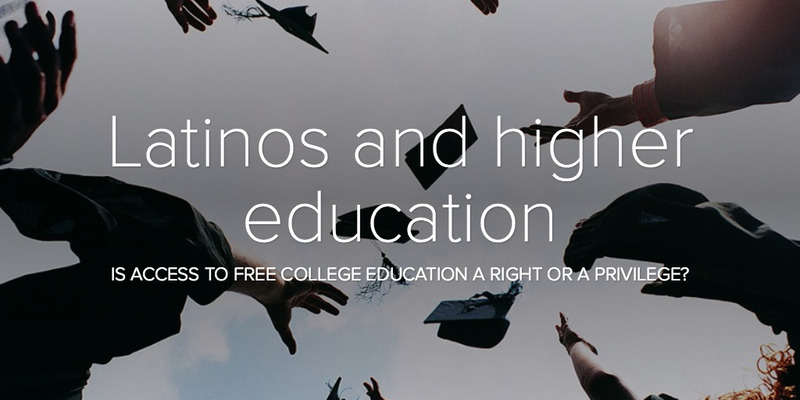 Is access to free college education a right or a privilege? Generals: “I don’t think it has a snowball's chance in you know where in this current government structure, but there is a lot of sentiment to do it in places like Tennessee, Oregon and in fact at CCP. We made an attempt to do it with private dollars by providing the gap between financial aid and the unmet need for students that graduate from high school in Philadelphia. It might not happen in my professional careers lifetime, but the country will come to realize the value of at least a two-year degree." Taylor: "The issue that I have free public education is that any time you get big government involved in doing something — can they deliver? My concern is ultimately if they get to the point to do that, that there is going to be the notion that they are going to fund it by reallocating resources that currently go to low income students, through the Pell system or any other means. And if you look at the private institutions in the U.S. out of the 6,000 colleges and universities we educate and graduate more low income students than the public sector does." Theobald: “It’s tied into the spirit of capitalism and the notion that the country shouldn’t be providing that type of support. To me personally, it’s akin to healthcare. Why are we the only developed country that doesn’t provide universal healthcare? We are a very young country and ... I think eventually that conversation, that narrative, will slowly change. There is a realization relative to the value of education but we are just not there yet." Padre Donohue: “Part of the problem in this country is that there’s inequality in terms of kind of education that is offered even in the public domain. The kind of schooling that children get in suburbs or cities, versus rural areas. Until we as a country can come to a sense of what all people should have in terms of education we are going to have this battle of private versus public versu state versus local." What can we do as a nation to alleviate the student debt situation? Parker: “The key is completion. Finishing with that debt and then it has a payoff, but as we know nationally only about 50 percent of students who start a four-year education finish. We are heavily into dual enrollment, same thing with the idea of accelerating students, still the major problem that we face is the college readiness of the students or the lack of when they enter." Theobald: “A core issue is also who completes. We have a system that whether you divide it by race or by income, there is this huge disparity across this groups on who’s getting this outcome. That is where we really have to work." Generals: “We are also moving away from this nebulous idea that a college degree will bring you success. The number of courses that don’t transfer or that don’t apply to a particular degree or the number of students that never get a degree because they flounder a couple of years adds to that debt. In terms of strategy, colleges are trying to provide much more focus starting with the dual enrollment programs that are creating pathways encouraging students to begin thinking about what they want to do and how you are going to get there. That reduces costs and it reduces time to completion." Sometimes what keeps somebody from graduating is not lack of ability but culture barriers. How do you deal with those cultural barriers at each of your institutions? Padre Donohue: “We have a relation with the National Hispanic Institute (NHI), which is located in Texas, and have not had much success in getting students to come from the Southwest to come to the Northeast and is not just the weather. It is a cultural thing, about where is the support is. Closeness to the family is very important. We haven’t quite grapple with that. Providing that support on the campus is difficult because you can’t replicate that." Parker: “Beyond cultural, I think is an economic barrier and we are seeing it in our institutions. Currently 70 percent of our students are part-time, they are rationing their time and their money. The economy has not been kind to the students we serve and as we know middle class is disappearing (...) wage stagnation and so forth has really handicap a lot of students and families. We know that time is the enemy of students, the longer it takes for them to finish the less likely they are to finish." Theobald: “We have taken a different tactic at Temple. If we look at research 50 years worth looking at what’s the impact of students working off campus on their success as a student. And been very consistently is students who work up to 15 hours off campus actually do better than students who don’t work. But once you get beyond 15 hours a week off campus you fall off a cliff in terms of the probability that you will complete your GPA if you are going to graduate school. In our Flying For initiative we’ve taken the 500 lowest income students that have sign up and said ‘we’ll give you a grant equal to what you’ve earn working 35 hours a week off campus but you have to sign a contract that you won’t work more than 15 hours a week.’ And in order to get that grant they have to stay on track to graduate in four years. This is the second year of that (initiative) and we have 628 more sophomores on track to graduate than we had last year." What are you doing to increase diversity, not just in the student body, but also at the faculty level? Taylor: "We developed an inclusivity strategic planning and we live by that. The very first day that I was officially on the job I hired several Latinos as multicultural recruiters. And then I said to the board we have to be bringing prominent Latinos for through trusteeship, and we are doing that. Based on the percentages we hired multiple Latino faculty last year, including international faculty because we are part of the Cabrini Worldwide Education network with 17 schools abroad, many of them in Latin America. Theobald: “We are all competing not just for the same students but for the same faculty. And a big part of our role being a research university is to train the faculty who can teach. We have 34 percent students of color, of those 2,300 are Latinos, that is the pipeline. We are trying to have graduate programs with a diverse group of graduates students that are training to become faculty." Generals: “It is really important that we have a welcoming environment culturally sensitive with some of the issues students are facing, and that is in terms of the counselors, the faculty and the support service. The cultural environment is key. Do we do a good job? We are far from it. The number of Latino faculty is single digits at CCP, we do better with the counseling and the support services. But we do have a strategically plan to improve those numbers and is absolutely a priority." Padre Donohue: "We have the advantage of going across the country. We can go outside the Philadelphia area. We have alums that are all over the place. But our board functions very different than some of the boards here because they have city requirements or state requirements or members on their board that are selected for them not that their boards select themselves. It’s a little different for a private institution. We think we can kind of tap into people differently." What role can universities play in increasing the participation of Latino and Latina students in STEM fields? Taylor: “STEM individuals tend to be more entrepreneurial and so there are always going to be avenues for them but if we don’t address the K-12 issues (...) high school is too late. Part of it are the cultural issues, you have the financial piece, but the other key piece is the academic preparation of Latinos in K-12 grade. 20 years ago you could say colleges and universities had an access problem, that problem no longer exists. There is a completion agenda issue and so if you look at the demographics, access for the most part has been addressed but just enrolling a student and putting all the policies, all of the support services in place to make sure that kid has a level playing field and the opportunity to complete is totally different. The biggest issue we have to do collectively in higher education is a better job in community outreach, working with parents, the familial the cultural, also working with K-12 to make sure that we are not only providing the kid an opportunity to enroll because otherwise what is the point." Parker: “More than anything is making sure that the students have a choice, and the only way they will have this is if they are college ready in math. That is where community colleges play such a critical role, 60 percent of our entering students are not college ready in math and, if that is the case, they can’t choose. All the exposure they get in STEM academies and high schools doesn’t matter unless they are able to exercise those options, otherwise the net number of folks doesn’t change. At that point natural choice will win out." Theobald: “We have a partnership with Philadelphia School District where STEM degree recipients can get a masters degree in middle school education and hopefully that then allows us to create more people with that kind of background."